The Lani Kai which is the boat operated by 'Friendly Charters' is a Molokini favorite! 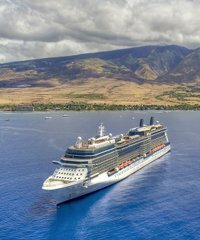 The Lani Kai has been operational as a boat visiting Molokini for many years. It is excellent as a moderately sized vessel that takes a maximum of just seventy passengers and is a motorized catamaran that is very stable in the water. 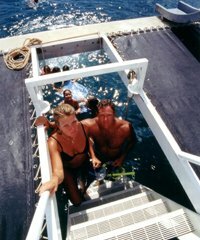 The Lani Kai has two decks that can be used for viewing and it goes to two separate locations to snorkel. The first of the locations is of course the island of Molokini which is generally best in the morning hours for snorkeling when the water is calm. The second location is along the south side of Maui near Makena or wherever the seas have the best conditions. Quite often this second location is a place called "Turtle Town" where the turtles are found in large quantities. 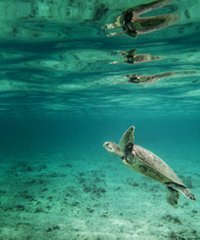 In addition to its morning Molokini snorkel tour the Lani Kai also offers an afternoon snorkel option. 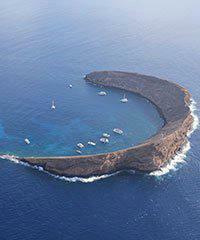 Molokini Island Crater is actually the tip of an extinct volcano, barely peeking above the ocean surface between Maui and Kahoolawe. Visibility is often 150 feet, tropical fish are everywhere, and its sheer cliffs and rugged beauty are often the focus of professional photographers.